The past week was an exercise in total lockdown for both gold and silver as the price managers have succeeded, at least for now, in herding investor behavior into a cacophony of complacency, where the maddening jumble of Fed Governors, CNBC commentators, newsletter tweet, podcasts, and email blasts have done their utmost to create the illusory effect known as "Goldilocks." The economy is running not too hot, not too cold, but somewhere in the vicinity of "room temperature." Humans that are seated in areas in that temperature range are rarely, if ever, stimulated to action; air conditioning units and furnaces are never summoned while comfort and safety permeate the room. 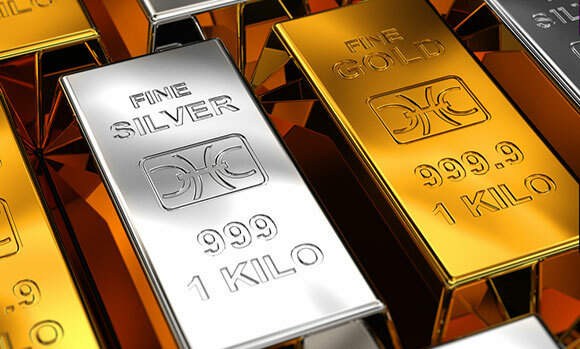 That reflects the prevailing action in stocks and in the metals as gold had an approximate $8.00 range on the week versus the week prior where volatility exceeded $32.00 for that week. The rudder steering the HMS Goldprice since the start of Q4/2018 has been "fear" and despite how harshly the global central bankers have stomped on the stimulation pedal, it has been the unbelievable move in the stock markets globally that have served to calm the nerves of an investor class that a mere three months prior was ready to hurl themselves off a bridge. In past times the stock market served as a barometer as opposed to a thermometer in its predictive powers over the economy. These days, stock price movements totally govern consumer spending habits as people defer major purchases when stocks are crashing with the opposite occurring when the markets are booming. 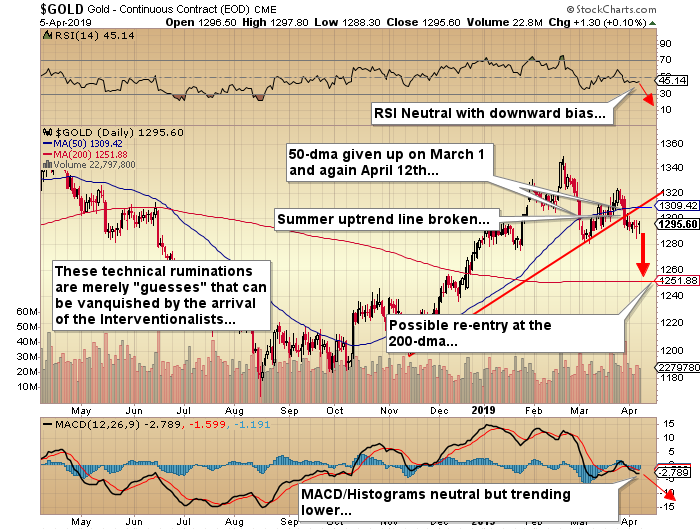 As you can see in the gold chart, everything on the surface appears tilted to the downside and it is my feeling that the set-up is one where the DUST and selected put options on the physical metals stand a superior chance of creating additional alpha rather than simply buying and holding those same metals and/or producers (or ETFs). 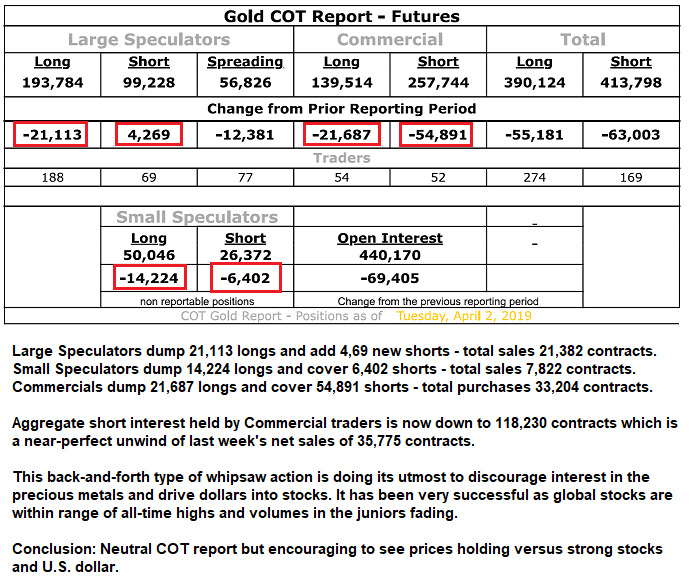 However, the thing I have to keep in mind is that in the absence of any regulatory monitoring, the bullion banks could run a screen play against a bearish set-up in order to create the kind of upside volume into which they could reload some of the 33,204 net shorts that they covered last week. So, RSI, the moving averages, trendlines, and the MACD/Histogram combo are merely rumination, a condition where these superficial negatives continue to replay themselves over and over again for no apparent reason other than the confirmation of recency bias dominating one's actions. For the record, I am trading from the short side of the metals via DUST:US and selected puts on the GLD. The position sizes are about a quarter of what I usually roll but rudderless ships are dangerous to follow and in the vernacular so commonly heard in the pork-belly pit, "Never short a dull market." What I mean by this is that I fully expect an intervention at any moment, especially if stocks begin to retrace their astounding move off the Christmas Eve lows but even more dangerous would be a short-lived downside gap in gold followed by enormous short covering by the Commercials just as the Large Speculators assess and react to those conditions exactly identical to the ones you see in this chart and ramp up THEIR shorts at the same time. 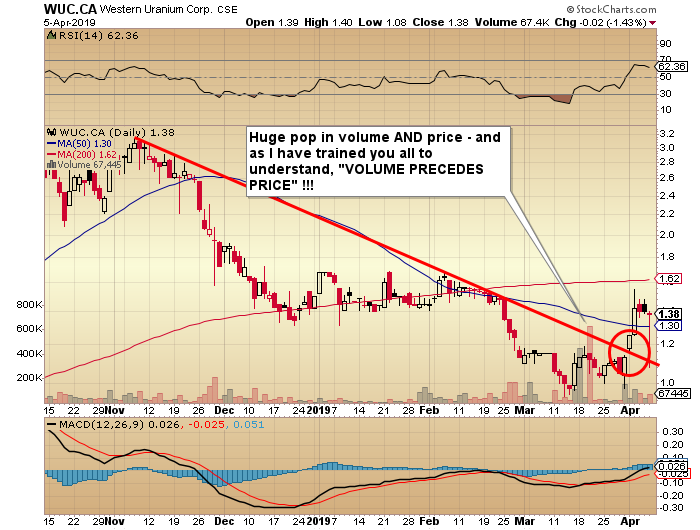 WUC is my first energy investment in years and I am participating in the current private placement, which offers a unit at $0.98 containing one share and one half-share purchase warrant exercisable at CA$1.70 for thirty-six months from closing date. If you have not yet expressed interest, the issue is about 70% through the over-allotment option so there may be an additional US$300,000 available as of the time of this missive. With the current market at $1.38 as of Friday's settlement price, the unit is priced at a 28.9% discount which is attractive by any and all measures but with Section 232 due to arrive on or about April 14, the lift could be substantial over the very near term. If 232 becomes a non-event, it will not detract from the longer-term outlook for a company trading at a US$40 million market cap (fully diluted) versus in ground metal value exceeding US$2.4 billion. This is precisely where the three-year purchase warrant kicks in and increases the notional size of one's share position by 50% which in a uranium bull could be one jewel of a "kicker."